Last year, Galaxy S5 was launched and the Galaxy Tab S was having the same design as of the device. Following the same trend, it looks like all new Samsung Galaxy Tab S2 is going to feature the design standards of this year’s Galaxy S6. These are still rumours and part of leaked images, but if it comes out to be true, then this is going to be the Samsung’s attempt for current iPad and also the Nexus 9. Alleged specifications of the Galaxy Tab S2 are Samsung Exynos chipset with octa-core CPU, 3GB RAM, 32GB storage, and 9.7inch display. The display is supposed to have a resolution of 2048×1536 pixels, just like the current generation of iPads and Nexus 9. The new tablet is also going to have a SIM card slot and microSD slot. Thus, adding a cellular connectivity feature along with storage expansion. The later one isn’t part of iPad, so it may give the device, a head start. As per the leaked images, it is clear that a metal frame is going to be holding the tablet, and the bottom side is going to hold two loudspeakers, microUSB port and 3.5mm audio jack. The left side is having Power button, Volume rocker keys, and SIM and microSD card slots. This also indicates that Samsung is going to restrict users from accessing the battery under the hood, just like the new S6. All these leaks and images are courtesy of @OneLeaks and everyone seems to be excited about this improved tablet. At this moment, we can expect the device to be launched in the month of June or July, but no official source is there to confirm this. 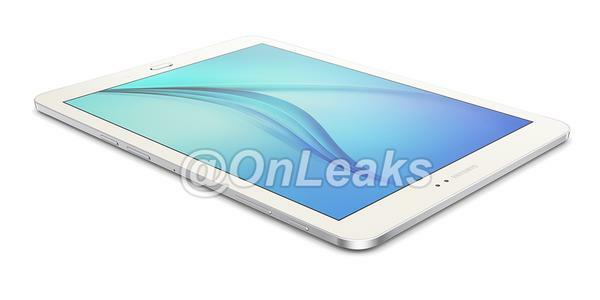 So, stay tuned and get ready to experience another ‘Next’ Galaxy from Samsung, but this time, a Tablet.